Bari is the capital city of the Apulia region. It is on the coastline of the Adriatic Sea. It is known as a port and university city and the city of Saint Nicholas. Bari is also known for it seafood, its handmade pasta, and its notable wines, which includes a delicious primitivo. This very well may have been my favorite city of the whole trip. One of the first things we saw when arriving in Bari was the Castle. This Castle was possibly built around 1132 by King Roger II. It was destroyed twenty-four years later by William I of Sicily. It was rebuilt and reinforced in 1233 by emperor Frederick II. Later is was acquired by Duke Ferdinand of Aragon who donated it to the Sforza family, the aristocracy of Poland. After the Queen of Poland’s death, the Castle was returned to the King of Naples. The Castle was built in the Aragonian style with the gate positioned on the side of the castle with oblique outer walls. The castle is surrounded by a moat on all sides, except the northern section, which was bordering the sea and can be accessed from the bridge and the gate on the southern side. It is currently used for exhibitions. Bari Vecchia is a series of maze-like labyrinths of tight, uneven alleyways. There are 40 churches, more than 120 shrines and two main squares, Piazza Mercantile and Piazza Ferrarese, in within the Old Town. As we walked through the old town, we saw many signs of traditional Italy. Clothes were drying in the fresh air on drying racks on the street and on drying racks suspended from the buildings. Shrines were attached to limestone walls. Small fruit and vegetable stands were set up in the streets. Little souvenir shops displayed their fares for all to see. Around every corner, it seemed as if we were being greeted by amazingly beautiful architecture and charm. Part of the charm of Bari is being able to walk through the Old Town and see the matrons of the city shaping beautiful pasta by hand. We were lucky enough to happen upon a few lovely ladies producing the ear-shaped pasta, orecchiette. The women who make the pasta are very industrious; in addition to feeding their families, they also sell these handmade beauties to nearby restaurants and to people passing by on the street. They were very friendly and helped to solidify Bari as a place I wouldn’t mind visiting again and again just to relive this interaction. Saint Nicholas was a 4th-century Christian saint to whom many miracles were attributed through his intercession (prayers to God on behalf of others). He also had a reputation for secret gift-giving, such as putting coins in the shoes of those who left them out for him. According also to legend, at the time that St. Nicholas remains were being moved from Myra to Bari on the sea, the terrible sea storm caused all of the other ships on the sea to sink. The only other item to survive this treacherous journey was a red pillar that washed up on the shore in Bari. This miracle irrevocably linked this pillar to St. Nicholas. 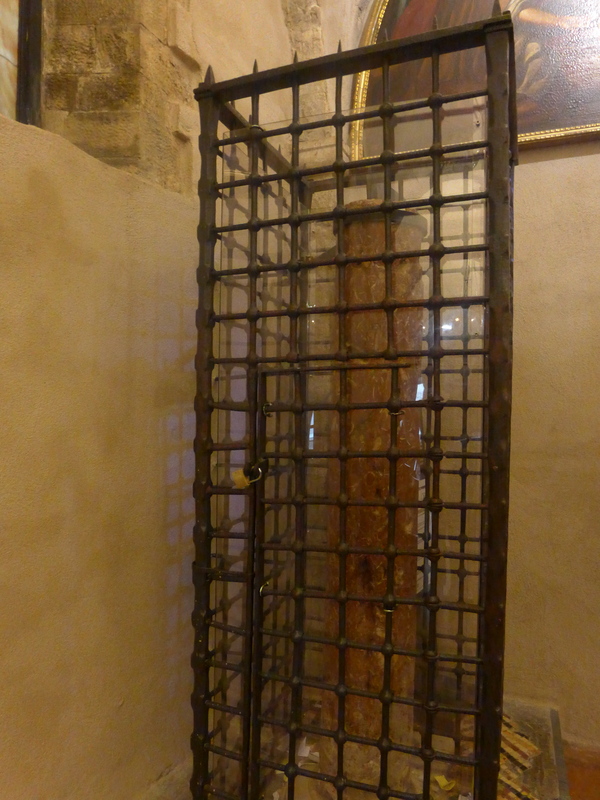 After this, many young maidens would visit Bari to touch this pillar, which remains wet despite not having an internal water source or not being near a body of water, in the hope that they would meet their true love through the grace of St. Nicolas. The Basilica of St. Nicholas was built between 1087 and 1197. The church’s founding was related to Barian soldiers in 1087 stealing relics and the saint’s bones from the original shrine in Myra, in what is now Turkey. On May 9, 1087, despite a terrible sea storm, the relics safely landed at Bari. A new church was built to shelter Nicholas’ remains and Pope Urban II was present at the consecration of the crypt in 1089. The edifice was officially consecrated in 1197. Every year on May 6-8, there is a huge celebration in Bari to mark the anniversary of the arrival of St. Nicholas bones in the city. The Basilica was absolutely breathtaking. The level of detail and craftsmanship visible in the facade of the church and the interior of the Basilica is wow-inducing. Each curved figure on the outside is representative of something spiritual. The ceiling inside the Basilica is something that definitely should be gazed upon in person. The shrine of St. Nicholas and the red pillar is located down a flight a stairs. Many worshipers visit the shrine to say a prayer. It is a very spiritual place to visit. 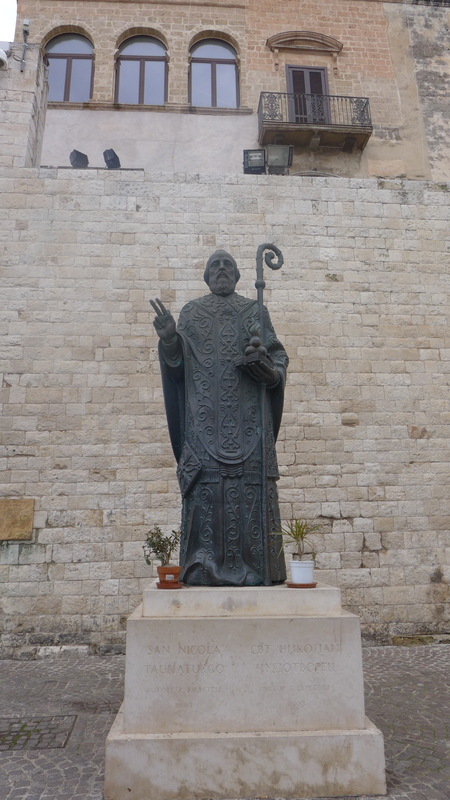 I highly recommend stopping by the Basilica if you find yourself in Bari. Piazza del Ferrarese provides the entrance to the old town. This piazza is lined with bars, cafés and an old section of roman road roped off in the middle. To the north of this piazza is the beautiful Piazza Mercantile. In this square’s northeast corner is the Colonna della Giustizia , where debtors were once tied and whipped. Our tour guide, Dionisio, introduced us to Panificio Fiore. This is a little store produced the best focaccia I had in Italy. Dionisio treated the group to a tasting of the focaccia with tomatoes and olives. My friend and I like it so much that we decided to grab one for ourselves as we continued to explore the city on our own during free time. It was a wonderful treat. After we picked up our focaccia from Panificio Bari, my friend and I made our way to the Lungomare Imperatore Augusto. Once you get past the sketchy staircase entrance, this promenade provided a magnificent walkway along the sea front, as well as superb views over the city itself. From the top of the wall, you could see the Adriatic Sea on one side and private homes and public buildings on the other side. in addition to this, you can also make your way down from the wall to walk along the sea. It was a lovely walk to take. After our walk along the wall, we explored the market off of Piazza del Ferrarese. The photos below don’t do justice to the range of colors on display at the market. My friend brought a basket of strawberries. Despite my dislike of strawberries, I tried one; it actually was the best tasting strawberry I ever had. The volcanic ash in the soil really produces great tasting fruits and vegetables, even though at times they appear to be spoiled. Even the street art in Italy is colorful and beautiful. As we waited to board our tour bus to our next destination, we stop by Caffe Baruccheli Bari for a cappuccino and to share a donut. It was the perfect treat after a wonderful exploration.